On the 27th October 1327, Elizabeth de Burgh died at Cullen Castle, Banffshire. Elizabeth was the second wife of Robert the Bruce and was queen consort of Scotland 1306-1327. Elizabeth was born c.1284 in County Down, Ulster, and was the daughter of Richard Óg de Burgh, 2nd Earl of Ulster, and his wife Margaret. 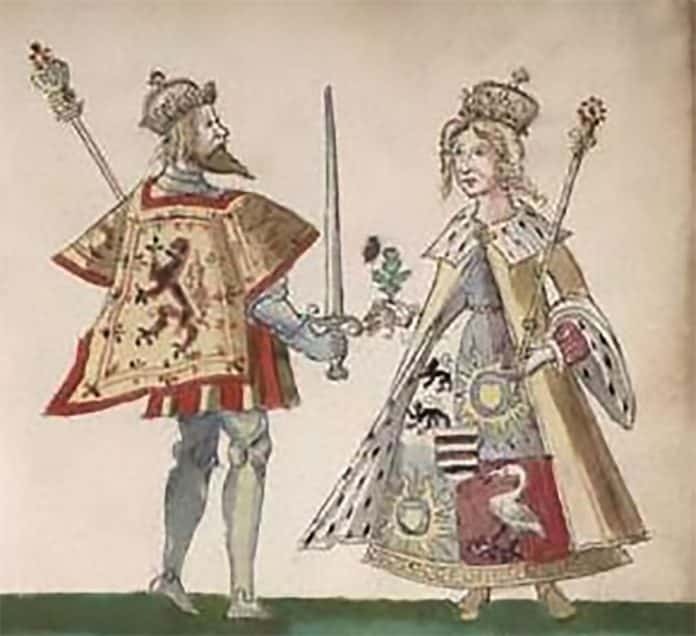 It is likely that Elizabeth met Robert the Bruce, then Earl of Carrick, at the English court, and they married in 1302 at Writtle, Essex, England. Writtle was one of Robert the Bruce’s father’s estates. It is also possible Writtle was the birthplace of Robert the Bruce. Following the crowning of Robert the Bruce as King of Scots on 25th March 1306, Elizabeth was crowned queen. Before Elizabeth’s body was taken to Dunfermline Abbey for burial, her internal organs were removed and buried at Cullen Old Kirk. Robert the Bruce paid the village an annual sum as a thank you for the treatment of his wife’s body.